Tom Jarman considers the Farmer Review after its publication in 2016, and asks why it is different this time and what can be done to tackle whole life costing and construction productivity. Modernise or die – how do we improve productivity and quality in construction? Recently, I heard Mark Farmer speaking about his report from 2016, Modernise or Die. He’s an inspiring speaker and it was a great presentation. I’m sure I wasn’t the only one in the room who was reinvigorated to go out and make a difference in a sector we enjoy working in and want to attract new people to. However, the elephant in the room with the Farmer Report is, of course, haven’t we been here before? Egan, Latham… that’s 20 years now of frustration with the construction sector and to a greater or lesser extent, appeals for it to pull its proverbial finger out. Mark tackled this directly, and described the difference this time as being a ‘burning platform’. He points out that the construction sector has survived each downturn, which has led to a sense of complacency that it will survive the next one. And this complacency is not entirely surprising; we will keep constructing, and there will continue to be a construction industry. We have to place this complacency in the land of lost opportunity. Construction productivity hasn’t really improved since the early 1990s, and this drags down the productivity of the entire UK economy. What’s more, productivity is key to decent wages and a knowledge economy. This is a real challenge for post-Brexit Britain. The Construction Leadership Council summarises this lost productivity as the equivalent of foregoing some £15bn a year. This is the equivalent to one extra Crossrail – every year. We wouldn’t need to decide whether to fund the Northern Powerhouse or Crossrail 2, we could spend what we currently are and get both. But there’s a more practical issue. At the end of each cycle, we’re building fewer houses, as shown in the graph, and building them through a much less diverse supply chain. 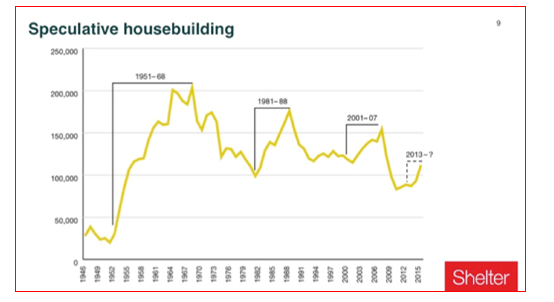 Figures from the FMB suggest that firms that build fewer than 500 homes a year have a smaller percentage of output than ever before. And our clients’ understanding of quality is not improving, as a deskilled client base uses D&B contracts to pass on risk. At the retail end, perception of quality is superficial; although some past complaints about the quality of some newbuild homes may be valid, they don’t tend to be about fundamental building performance. All of this indicates a less resilient, sustainable construction industry, increasingly transactional and lacking the client leadership that might challenge business as usual. My concern about our current situation is that so much power has now transferred from clients that they are probably not in a position where they have the skill and confidence to challenge existing industry practice. And industry practice, as Mark Farmer very clearly outlines, isn’t as good as it should be, and the industry is far from being well placed to cope with the demographic, carbon and productivity challenges of the future. But I’m not sure the alternative to modernisation is death. I think it’s worse; slow decline, and lost opportunities – for exports, attracting and retaining young, enthusiastic workers, and to fill the housing gap within available resources and with good quality housing. Think of where we would like to be; an attractive, well-paid industry respected for its innovation and quality. And what would create the space for this? A much more demanding, informed client base, focussing on outcome. Social landlords, the hidden volume client who collectively commission some 20 per cent of all newbuild housing in any year, and own and manage some 17 per cent of the national housing stock over the long term. The National Housing Federation has an ambition for the sector to build 120,000 homes a year by 2035. There is a critical decision point here; do they become another volume builder, or do they lead as clients and invest in good quality, comfortable, climate-resilient homes? We need to come together, and be more engaged and driven to improve our industry. And ironically, if you’re reading this you’re probably already engaged. But we need to reiterate to clients at every opportunity that there is not a linear connection between build quality and cost, using examples in practice to show what can be built within cost ranges they will be familiar with. If we can’t do that, then more power to the naysayers. And what is the next report on the construction sector going to be called? ‘Modernise or Die’ raises the stakes; that leaves us ‘Turn off the Lights’ as volume IV. None of us want that – do we? This blog was original published on the St Gobain Multicomfort website in December 2017. Tom has been interested in sustainability since the first bottle banks were opened in his home town in the late 1970s. 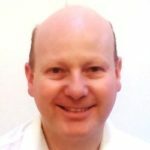 He has since worked in the private and public sector, managing teams and in project development and management. He now works in low carbon new build, deep retrofit, future energy systems and building information modelling. 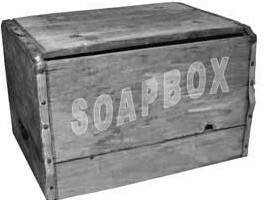 The Soapbox slot is open to any AECB member with a message they want to get across to fellow members and to the wider sustainable building world – the AECB website has at least 60,000 people viewing it every year. If you’ve got an important point to make, follow our guidelines and submission instructions here. This entry was posted on Monday, January 15th, 2018 at 1:46 pm	and is filed under Soapbox. You can follow any responses to this entry through the RSS 2.0 feed. Both comments and pings are currently closed.